How odd to realize that October is almost starting! Tie yourself up now, just 3 more months till the end of another year. You will be surprised to see how speedy these last months will pass away! Yesterday Jan and I had a good laugh. I must explain first something. On tv there is a certain commercial(I hate the commercials, breaking up a good film or other program), but you are forced to watch them. There is one, I think it is from Axe, a guy is taking a shower with that specail Axe showergel, his wife or girlfriend is waiting for him in the bedroom. He comes out of the bathroom, some waterdrops still on his body, she touches him and then they start a kind of sumo wrestling, the message in the commercial is that this showergel makes your skin irresistable. Well, whatever!!!! But yesterday Jan took a shower and just before he went into the bathroom I said to him with a very serious face: "Oh Jan, take care whick showergel you take, you'll never know". First he looked to me very surprised and said: "I don;t understand, why do I have to do that suddenly? I just take one that is there." Then I warned him again and suddenly "the quarter fell in its place"s to say. "Don't worry"he said, "we dont; have that brand, so you can stay at the computer, we don;t have to start a wrëstling match!!! When I now write this down, it doesn't look so funny, but at the time tears from laughing runned down my face. We have at times the same humour and understand the meaning of just half a remark. I am glad, we still have that at times. Laughing does good to a person, no matter about what you have fun. The kit for today is an oriental one. I think the colours are coming nice together. I was thinking and thinking about the title for it and looked again and again at the papers. I found them so relaxing and then the word "Zen"came into my mind. And that's now the name of the kit. I hope you will like this colourscheme as much as I do. Well, have all again a nice day, I must think of another kit for tomorrow. I already have one in mind to make, but that will be one I must spend a lot more time on. I think it will be a much larger one, so probably, when it will be done, I will have to split up the downloads in a few days. We'll see about that. First a smaller one for tomorrow. Oh, how hard is the life of a designer sometimes. Our brains are working overtime now and then!!!LOL. Don't feel sorry for us, we love it(most of the time), hahaha. Remember how I planned yesterday a long day at the computer to finish my kit etc.?? Forget it! Jan was on the couch, cuddled up in his bedcover, I think he catched a cold or so, and I was in the room completely prepared to go on with all I wanted and then ... knock... knock on the window. Who was there? Rob, Jan's brother with his son! Awefully nice of him to check how we were doing, but for me and Jan it wasn't the right moment. Well, of course they came in and had something to drink. All by all they didn;t stay too long but I think it was at least for an hour or so. My whole day broken up. So you see, it's better I make no schedule and plans, because 9 times out of 10 they don't work out. Still I managed to finish the kit, but it isn;t now a very big one. I even started with a new one, but there has still to be done some work on it. Yesterday evening I went on with the crochet thing, it is pogression slow, but sure. I am making larger squares so it looks as if it is going rather quick. But I still need to make a lot of them! It doesn;t matter, I like to have my hands busy when I watch the tv. When the blanket is ready one day, I shall try to make a picture of it and show it to you, okay? Here is the kit I finished yesterday, it is with wolves in it and I namend it "On the Steppes". It is a bit dark of colour, but I thought these colours just fitted weel with the wolve's pictures. Up to you to decide if you like it. I hope you will have a fine day and that the plans you made will smoothly be executed, LOL. Oh, I love quiet Sundays! You will have to admire me!! I didn't go to the fair yesterday afternoon, so I wasn't tempted by anything. How strong of me. HAHAHAHAHA! Then at about 06.00 o'clock I got a phonecall from Danny, Heidi's husband with the question if I could take their doggy for a little walk. They were out and it would take longer time for them to get home, so the poor thing was probably almost bursting. Of course I went to their house and Bas, the little dog was veru happy to see me. We took a little walk, so he could do what was necessary and he looked so sad when I left again. Today I really want to finish a kit I was working on, it just isn;t going fast, not that it is a big one, but I just cannot desice what to make for it. Do you recognize this lack of inspiration? But today it must be done and I want to try to make another one. I'll have to, because otherwise there will be nothing for you tomorrow. How awefull!! So you understand the title of the post, I will take a real quiet day, just computering and in between watching a bit of sport on tv. And already know what to make for dinner today. I bought some lamb filets and will make first a marinade for it and then bake them just a bit rosé. I like lamb meat, it normally is very tender which will be easy for Jan too. I am glad he is starting to eat a bit better. It's going by little steps, but improving. Well, I must get starting so I will just post the kit and then say goodbye to you till tomorrow. Hope you all will have a nice weekend. So I am late, so what??? Hey, I know, I am rather late today. But yesterday evening, or better to say night, Jan and I stayed up late to watch a film on tv. It was an interesting one, so we just held on and went to bed not earlier than 03.00 o'clock. Pooh! I am not used to it anymore as I was in my 20's. LOL So I slept just a little longer( somehow I just wake up around the same time every morning) and did it all in a very quiet pace. I will probably get the blow of it this afternoon or early evening, sitting on the couch. Better I stay busy, or on the computer or at least with my hands on the crocheting, otherwise suddenly the shutters will close in front of my eyes. HAHAHAHA! It's looking fine outside agian, and if I am not wrong there is a small fair close to our home. It is the same each year but with the nice weather it should be good to go outside and take a look. Always dangerous for me! Why? Because I always see something nice that suddenly I MUST have, you know the feeling????????? Even if it is just a small and cheap thing, I just HAVE to spend some money. It's a terrible thing with me, but it cannot hurt too much if I can afford it. Well, may be I can get Jan on his feet to talk the walk also. I know he isn't very in for that kind of thing but it is more the idea he gets some fresh air. We'll see what happens the afternoon. The kit for today is a playcard related one, called it "Queen of Hearts". But it has some possibilities for different kind of pictures I think. Normally you think with the playcard Queen of Hearts of the red colour, but I took a two colour scheme to give it some variation. The frames and two hearts with ribbon are from Anna http://deliciousscraps.blogspot.com/. I like to use her stuff, and she makes sooooooooo much of all kind of cu freebies that she is almost becoming my number 1 supplier!!!! Hope you will like the kit and I wish you all a very nice day. You really feel the Autumn. Autumn is really here now. Especially if you feel the temperature in the mornings. You could call it fresh. But you also see it by the light, it has a kind of different colour. Then the days are WAY shorter already! But when the sun is shining during the day there are wonderful moments to enjoy. Like yesterday, when Heidi came over for a short visit. First we sat in the room, she wanted to know all about Jan, so she talked a bit with him. Then, as always she wants to have a look in the garden. And in the sun it was so nice that we sat there for about half an hour. The last few weeks Heidi's condition diminished some which isn't good. I think she still has too much on her mind and is trying to do too much. E.g. two weeks ago she had to work 4 days of about 5 hours a day instead of 2 days as normal. And that is something she must not do. Plus the normal household things and little appointments with dentist, hairdresser, fysio therapeut swimming lessons for the little one, etc. she is exhausting herself. And after a while she gets the blow from it. And then it takes some time to recover. But how to let her do less and still letting her feel "useful"???? That's difficult. I think I go over today and talk a bit with her. Not that that will help a lot, but already the fact she can speak out will do her good! So you see, everybody has his/her own problems in life! And she is such a sweetie, you know. As she left she said she would look for a bottle of alcohol free "champagne" for Jan to celebrate Monday his one week without any alcohol. It doesn't matter if she brings it or not, just the idea of it is wonderful! What kit I have for you today? I made it with the intent to be a kind of wedding kit, but a lot of it you also can use for lots of other pictures, but still with a bit of romantic touch in them. I named it "Two Hearts, One Life". Well, if you decide to live your life with your loved one, it becomes "One Life"ruled by two hearts, isn' it? Well, have all a very nice Friday, try not to be too stressed and enjoy the fact that weekend is very near! We just returned from the doctor and it was uplisting news. She had seen in the bloodsample and urine sample that his values were improved slightly. She was pleased to hear Jan is without alcohol now for 4 days and that it seems to go well. She said that the liver had improved also a tiny bit in his functions. And when I told her, Jan was in the cafe for a while yesterday evening and he had only cola, she gave him a real compliment. The barowner will look for the totally alcohol free beer and have it in stock for Jan. Isn't that nice?When we told her we were eating with much less salt, she complimented us for that too. In fact Jan is loosing now more salt which is a good thing. Still long way to go, but it is positive, isn't it? He also told he already is feeling a bit fitter and more active and she explained it is of the lack of the alcohol. Now he has his next appointment in two weeks. She wants to keep him under control, of course. But all together, we have had a little boost that we are on the good way. It must have been also your positive vibes and thoughts in our direction that did it. Thanks, but.........keep on doing that, it is still needed. Wow, I am feeling soooo good for the moment! So, the sun is shining from time to time outside, but also a bit in the house again. I sincerely hope, it will be so for a long time! Today I have another Halloween kit for you, but a bit more in a funny way(I think). It has to have a name so I made it "Spooky Halloween". I hope you can use it and have fun in using it. Have all a wonderful day!!!!! It seems, Mediafire is out of the air for a short time for maintenance. So I couldn't upload your freebie. I will do it later today, as first we have to go to the doctor's appointment and later on Heidi said, she would pay us a quick visit. I'll return later today and let you know what news the doctor might have had. Can do another cup of coffee and then must move on. Yesterday early afternoon I went for a bit of shopping and as I came home Jan was sitting on the couch with a kind of help-asking face. He told me, that he was changing a little thing on the tv (just not 3 moths old) and suddenly he had no screenpicture anymore. Well, first I asked what he did, probably he touched a wrong button or so, I thought. He told me, I tried a few things out, but still............just one blue screen with nothing! Very strange. Took the installation book, perhaps it could help. NOT!!! Then also we couldn;t get the program numbers of the staions anymore, only one or two with an X in front of it. VERY WEIRD, So then I got EXTREMELY nervous, that was the last thing I needed. Boy, new tv and alreday broke???? Then I first wanted to do the freebielist but............ no internet!!! I gave up and called the store where we bought the tv. Perhaps the salesman there knew what was the matter with the tv. Explained, he didn't kow. It was something he never heard of yet (the X thing) So he typed in all and promised us that as soon as possible a repare guy would come to look at it. We all down, certainly Jan, the tv is his hold on for the moment. Well, after a while I made something to eat, Jan wanted to put up some music, almost no radio!! At that time already a small light was going to burn in my brain. Per haps something was wrong with the cable and internet provider. We spent a quiet evening, I got Jan on the chair at the computer and started him the Freecel game(for that no internet was needed). I took a book and finally finished it and did some crocheting. In between we listend to some cd's. On and off I checked on the internet, still nothing. At about 22.00 hours I checked the radio again, MIRACLE, it worked again. With little hope in my heart I sneeky tried the tv. even BIGGIGER MIRACLE!!! It worked again as smoothly as evenr. Boy, were we relieved! I already was making up a strategy how to get a new tv without paying and one equal to this one(we had the last one in that series in the store!! ), etc.etc. Then I tried the internet again. It worked.!!!!! So I suppose there was something wrong at the provider's yesterday, but it is VERY ANNOYING when you don;t know anything. My gosh, what a day. Basically the sentiment behind the original award is that it is an award that not only highlights blogs that are pleasing or special in some way, but the award was also designed to extend the hand of friendship around the world. 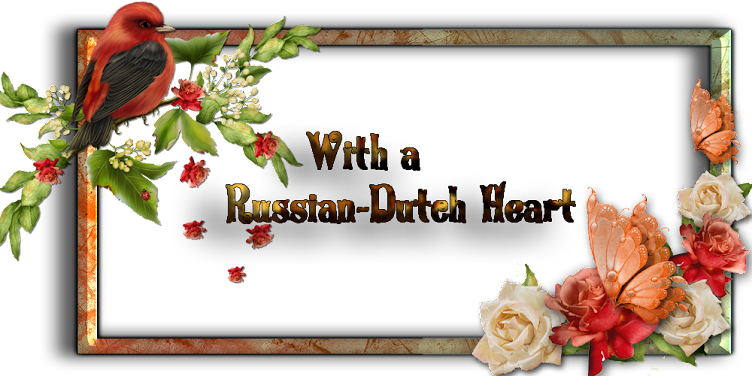 With a Russian/Dutch Heart Design: Kyra’s website otherwise known as “smiekeltje” is a lovely blog site. Kyra is a talented designer who writes from the heart and designs some truly beautiful kits. Thank you Kyra, I always enjoy reading through your site. Now it's up to me to pass it on. How hard! I am not giving a big description why I chose these blogs. But you can guess, that is must be nice ladies, with wonderful freebies as extra and nice blogs to read. Just because I like her work a lot. I keep it to these four, I know some more, of course, but there is a choice to be made. And here is the freebie for today, with a simple name: Vivace. Hope you enjoy it. Have all a nice day, hopefully this afternoon I can put up the freebielist!!! Let me start with appologizing for the fact that I might be rambling about Jan's situation. But you ca understand it is important and for the moment a big part of our life. Whoopee, hooray, Jan survived his first day without any beer! I think he never drunk so much coffee and soda before in his life. He even said to me that he might try again some ta now and then! But I know, the first day or even second and third will not be the hardest. But I am proud of him, that he made a start. For the moment I lack for any inspiration writing, so I think I'll levae it tody to this short post. But not without giving you a new kit. As we are very close to the end of summer(well, for half the world anyway) I made a kit just about that. Just good for the last summer pictures you might have. I really like the colours in it. It seems, that in the moment I am making rather a lot of kits in soft colours. Strange how the colour schemes can change without any plan for it. Okay, just have fun with it I hope and I'll see you again tomorrow! And yes, here it goes again, with the start of a new and probably tensed moments. As I wrote a lot yesterday I think I must keep it a bit shorter today. In fact not much else to do, because it was a quiet day. As from today Jan said to me he will try to cut the beer completely, so yesterday he savoured some for the last time. I feel so sorry for him, but I am glad he has the intention to do the best. Then he said to me: I still have 3 days to think it over if I am going to hospital for a bit of time, isn't it? (Thursday is ahgain doctor visit). Well, he said, I first want to know what the doctor is planning to do with me. If she is going to do all kind of testing as if I am a guinea pig, I am not going. Because I am not looking forward to be there, and certainly not is they come each half hour with something new! I said, it certainly wouldn't be that bad( I have to say something! ), but that we would ask her. So perhaps, perhaps there is a slight chance he is considering it, if it is not for too long. So I am not jumping high from joy yet, we will see. Early in the afternoon the sun was shining so nicely, that I went into the garden and planted some tulip bulbs for next spring. Hopefully they will come out. And I also did some pruning and cleaning, not all that is necessary, but it's already looking better. It was good to be outside and I just picked out the right time, because a bit later the sun disappeared again. And I made a rather nice dinner(with very LOW salt percentage, yeah!) and Jan said it still was eatbale and to live with. HOORAY! And I was supportive, because I ate the same stuff. Boy, I really must get used to it, but if he can I can too. That's the news from yesterday. Now the kit. I think it is a bit funny one, we are going back to our childhood you could say. Because of what???? I made a gnome kit again. Perhaps you still remember I made one, but looooong ago. So here is another one. I named it"Hidden Little Helpers". Sweet, isn't it? I hope you can have some fun with it. Enjoy your day,this afternoon I will have again the freebielist. Must get back to the old routine, hahaha. Well, the break did last a bit longer than I thought, but it was good for me. I just needed it. Last week was in fact a quiet week, but... also with a lot to think about. I try to make it short. Jan and I visited the doctor on Thursday and we had some good news and also some not so good. The good news was, that with the last test they took again other samples from his gullet an other things and no bad cells were found. So that was a reassurance to us. Then the doctor told us some things, we already new deep in our heart. Jan's liver isn't in a good condition, he is suffering of a cirrosus(do I write this okay?). He was offered a few options. Keep on drinking his beer will not be good for him, his life will be very much shortend to say it mildly. Or stop immediately with all alcohol, it will not heal it, but then he could celebrate a lot more anniversaties of the wedding day. He also is still holding fluid in his body, specially his belly. He already has medicin for it, but she adviced to cut on the salt in his food. Not necessary to start eating completely without salt, but a drastic cut down would help. So I will have to start cooking quit different. Okay, I can do that, I think, with still being the food tasteful. Jan still isn't eating much, he lacks of appetite and then I know it isn't easy to swallow donw something. But as result he lost quit some weight and that has to come back. As result of the weight loss he lacks of energy and as result of that his muscles are diminishing of power etc. etc. etc. The doctor suggeted he comes in the hospital for a time, perhaps a week, may be more, so that she can keep a good eye on him and can try to feed him extra. I would love that, but for him it is a big decision. He, with his abhorrence of hospitals and such, doesn't like the idea at all, but he is thinking about it. He knows, he has to do something but for him it will be very difficult the coming time. Oh, also his bloodpressure was too low. So you understand we had a rather tensed week and certainly the last few days. I know he wouldn't be pleased (to say it mildly) that I write this all down, but why keep it hidden? He already told it to soe friends, also in the cafe, that the coming time he will not be often there because of the situation. He isn't a man of drinking lot of soda or that kind of stuff, so it will be better to avoid the temptation. But I know, a lot is going through his mind now and I cannot help him much to make decisions. He has to do it himself, otherwise it has no result. But it will be hard for him, especially the first few weeks. He likes his beers, and he is a social drinker as they say. So he is afraid also to loose his contacts, and to stop from one day to another with it it as hard as to stop with smoking. It needs a lot of persevarance. But if your life is depending on it, I don;t think there is much choice. Well, one thing is for sure, our life will change and I will try to help him in anyway I can, no doubt about that. But I will be prepared on moments, the mood will not be so bright and happy. I am sure it will come. Well, then there will some lightning and thunder here, and afterwards the clouds will dissappear again and we will go on. What else is there to do????????? So now I bothered you enough with our upcoming problems. For the rest I ussed this week to travel a bit on the computer, did some designing and had a good time. I must say the weather isn't so bad either, not too warm, but still quit some sunshine. I was planning to work a bit in the garden, but I hadn't the energy for it. The next cople of weeks I will have to do some in it, preparing it already for the wintertime. Well, once I get started, it will be done rather quick, I hope. You know what?? I started crocheting again! I bought some woll, very nice soft one and started to make a bedcover. I make large squares, all will be made with different stiches and that is my project this autumn, when I sit in front of the tv. It will take some time to make, but I don;t mind. I have the colors of a soft yellow and a bright kind of olive green, very nice and happy combination. I will crochet the squares together with white wool. I am happy I started crochet again, I like to do it. So you see, I always try to be busy with something. I can sit sometimes, doing nothing more than watching tv, but never can keep that up for a long time. I think, am very much like my mother in this. Okay, you are briefed again, so it will be time for a new kit. No, first I must they thanks to all you wonderful ladies for your kind messages! It was so nice to receive and read them. You are just marvellous. A big hug for you all! Now I am coming to the new kit. I have some in stock again, not as much as I wanted to, but I took it easy, as you know. Todays kit is a country related one. I named it "Smell the country air"and surely hope you will like it. Anyway, I am back again, not sure if already today I will have a new freebielist for you, but for sure there will be one again tomorrow. Just depends a bit on what I will do today, I want to make something nice for dinner, without salt, or almost without it and that will be a different way of cooking, you know. And still make it taste. But I know, I will have to use more herbs etc, I also bought a little boxx with "low salt"for Jan. It contains about 70% less natrium than the normal kitchen salt. That's a start. I want to wish you all a very nice and pleasant Sunday, and I can say now: till tomorrow!! Hugs and a cuddle to all!!! Sometimes I need to take a little step back. So in a few days there will be all the bla-bla and freebies again. Hope you are not cross with me! Have some marvellous days and see you real soon. Thanks for your thoughts about Jan. Well, it all went well, and I must say he was quick back home, considering all. I must always laugh a bit, when he comes home from such an experience. He walks then very cautious and looks still a bit dizzy, if you didn't know better you could say he looked stoned!!! But of course that is the effect of the anaesthetic he had. This time they even offered him a sandwich and cup of coffee before he went home. Nice hmmm? Glad that is again behind us, now wait for the results. I must say we did sleep rather sound this night. For me that is not so astonishing, but Jan doesn't sleep well the last months. Often awake, or just not falling to sleep. But last night he slept for sure 4 or 5 hours in a row. Wow, what an experience for him. So sweet of Heidi yesterday. In the afternoon she phoned us immediately to inform how it went with Jan. How busy she may be, she never forgets those things. Just may be I will get a phoncall from her today, that we are going to the garden center for one of the last times this year. She wasn't yet sure, but it should be nice to spent some time together there. We always have a lot of fun then. How are you Texans doing for the moment? I heard Ike is alreday messing up a bit and didn't yet arrived completely. Hope you all will be okay. Take care please. I wish you all a fantastic weekend, with lots to enjoy. First have to make excuses for not posting a freebielist yesterday! I think I started it 4 times over(i make it first on the "scribbling-block"on te computer) but I don't know what is wrong with the computer. Every time suddenly IE got stuck and I had to start over the computer again and the list. Also Firefox didn't cooperate. So I finally gave it up. Then I let run an anti spyware, perhaps it helped, it found some , but not really nasty ones. I hope it will be over now and surely not hope to make a sustem recovery. It isn't so bad yet, but I rather skip it. Well, we'll see what today will bring. Now Jan is preparing to go to the hospital for another test, poor thing. It's about the same from a few weeks ago, with a minor anaesthetic. So we were up quit early this morning. He is not looking too happy, he hates hospitals, but he has to go through with it now, I do want him to get a lot better than at the moment! Oh, what a great weather it was yesterday! I could go out without any coat, sun was bright and warm, I was in such a good mood (it was before the computer thing, LOL) I already did about ALL the grocerie shopping for the week-end and even have reserves for longer. Then I noticed that suddenly I was running out of socks! Funny, hmmmm. So I went on the search for a few pair and found some. Especially for the winter time I like long ones, much warmer, and I also found those. They are nice ones, horizontally striped in black and grey and light blue grey with on the top a little button on a little bow. Fancy, hey?? And what is there in store for you today? It's a blue kit, fantasy., "Spell of the Wizard". I like the blues in it, it makes it a bit mysterious, don't you think? So have some "mysterious"fun with it, let your spell work well with making nice scraps with it! I hope that today the freebielist will work. Will it be the last beautiful day? Yes, I did visit Heidi yesterday, finally! It even became nice weather so we could sit in the garden. We had some talk to do, after not seeing eachother for a few weeks already. Séverine also was home, because on wednesdays the little children have only a half day of school. And big news, she can read(well, is starting). Actually she recognizes 4 WHOLE WORDS. Wow, now only the rest, LOL. And she also has started to write. They are now practising every few days a new letter, well, you know how it goes. So now they will grow up faster than you think. She proudly showed me yesterday a tooth that was wobbling and wriggling in her mouth! She is quit a character, that little sweet devil. It seems, today we will have a very nice and warm day, but it only will be for one day. So strange the weather lately. It changes every day, in big curves. Hopeless. But let's enjoy today, it may be the last real nice day of September. But you never can tell around here. It could be that we will have some very nice weather still in October. Brrrr, I just don't want to think about the winter yet! Don't like too much the cold. Okay, let's go to the kit. One colourscheme, today, in the brown. And no, it isn't an autumn kit. It is another horse kit, I just like horses and found some beautiful pictures to make the papers. So hopefully you will like this one, although I already made some horse kits before. I named it : "Fly with the Wind". Oh I think I made a little type mistake in the name, so probably you will get a more or less strange name on the ZIP file, something like Fly ith the Wind. Sorry, but when I noticed I already had uploaded it and I must admit I was too lazy to change it and upload it again. I am terrible! Hope you all will have a nice day too. I'll have to show you something. The visit of our friend yesterday was nice. He did enjoyed his sweet traet and was very enthousiastic about my computer. And now showtime and so on. First I received again the brilliant blog award. Aren't they just gorgious???? It's a lady with fantasy and talent! And now the new kit for you. I think it is a kit you can use for a lot of things, but as I have to give it a name it became"Confidence". That can mean confidence in yourself, in some other people or in a mysterious presence. Just look at one of the papers where it says: "Be true to yourself". I like that phrase. So I hope you also will like this kit, it's in very fresh colours, that make you feel happy. Oh, the two frames are from Delicious Scraps, I just adjusted them a bit. Have a very nice day indeed. Well, the internet was still going on and off yesterday. How very unpleasant it was. I was just lucky to have the time to post, because when I started to collect the freebiesites, it stopped again. So there was no freebielist yesterday. Now today I must shake myself and have to be shorter with the post, because I want to do a few things in the house before our friend is coming. And I must go to the bakery for something sweet with the coffee. Well, today there is my first Halloween kit this year. I think it will be followed by one ore two more next month. You know, I already find such nice things for Christmas kits, I already am assembling them in a specail map, to have them ready for use. I like making Christmas kits, and don't ask me why. Yesterday I bought a few very nice tulip bulbs for a low price. They must be planted this month or even next. And yes, I must spend again some time in the garden, to clean it up again. How fast everything is growing! Aweful, sometimes. Okay, finished with the little talk. Here is the kit "Ghostly Night"and I hope you will enjoy it. Have lots of fun, be happy with another day and spend it as cosy as you can. Yes, you read it well. It's already late in the afternoon. Internet was playing tricks with me, so I couldn't update my blog till now. It will be a very short post. Oh, in a way, it was a good thing I couldn't be on the net. I shut down the computer(after just a little bit starting a kit) and I did some things in the house. I ironed a great part of the laundry, I found a place for the big box of my computer(better to keep it for a while), so the bedroom is much spacier. Did some necessary shopping it was a fruitful day. But I am glad internet is working again!!! Tomorrow a friend is coming to visit to take a look at the new computer . He's always very interested in those things. Have to buy tomorrow morning something tasty to go with the coffee. He is a terrible lover of pastry and cookies, so the few times he comes over I always have something for him. He enjoys it so much. Sometimes you don't have to do much to make someone happy! Now the kit. It was sooo much fun to make this. I truly hope you will like it. It is not such a big sized one, but nice. It has all to do with dance, about a special dance: the tango! The kit is named "Passionate Tango" and I hope you will have some pictures with fire and emotion to go with it. And how amazing the show was!! Not only amazing, but very beautiful and touching and full of respect for the sporters. It was such a feast to watch it. One of the spectacles was a ballet of about 200 ballet dancers. Not too amazing, you should think. But it was a group of girls which were all deaf. How to dance on the music then and specially all at the same time? There were a few ladies who, with gestures gave the tempo and the movements to be done. I never saw a thing like that before. It was more than beautiful. If you have a chance to see it perhaps in a summary on tv, I recommand you to look at it and I am sure you will agree with me. It was stunning how the show was put together. What a fantasy was used by the creator of it. You can notice it had a great impact on me, whle I am still talking about it and I am still very enthousiastic. Today the sport is starting and I want to watch some of the games, for sure. I must be honest with you. It will be perhaps sometimes, a bit hard to watch, because you will have to look beyond their physical appearance sometimes. Not because I cannot watch a disabled person, but more because it hurts a bit. But you must forget about that and certainly not think they are pitiful. I think that in a way we must admire those sporters evenmore than the regular sporters. In a lot of cases they had to fight, train harder and had to have more perseverance than the not disabled ones. I think the attituede towards the paralympics is changing more and more, The world is looking at those people less and less with pitty in their heart and more and more with admiration and acceptance. That is a good thing. What a speech came out of my fingers. I wasn't planning this at all, but just typing the words just came. And why not, they are great people. And now today I have a kind of Back to school kit for you. School has started again, surely regretted by a lot of children (hahaha). Because vacation is a great thing, but unfortunately there is school to attend to. Well, on the other hand we'll have to be glad that there is school. Still a lot of children don't have that possibility. I know, when you are a child, you don;t think too much about that, and that's a good thing too in a way. Soon enough the children are grown up and will hav to face the real, big and often mean world. So let hem enjoy as much as possible their schooldays, and let them be child! Oh boy, what is the matter with me today? I am rather in a phylosophical mood. How strange! Well, let me wish you an enjoyable Sunday, have fun, try to relax this one day left of the weekend and I'll "see" you tomorrow. Yeah, autumn is very near now. Looking at the weather it certainly is. Can you imagine we already have to focus on some holidays in the next months? I saw on some counter that Christmas is about a 110 days away? It seems still a long time to go, but be prepared: before you know it we are decorating our houses with all the Christmas stuff. Somewhat frightening, isn't it? But certainly we designers have to think ahead and plan already for the holiday kits. Brrrrr, first better to think of the autumn, then there is Halloween and for a part of the world Thanksgiving, then here in Europe is Sinterklaas and then already Christmas and New Year. I always wondered why for eample my parents and grandparents so much sighed with the remark: how times is passing quickly, I never understood that but reaching a bit their age now I am beginning to understand. When we were much younger we always looked anxiously ahead, now we rather look not too much ahead and often look back in time. How things can change in a lifetime! Today I have the other Mucha kit I was talking about. It is about the four seasons of the year, and the little bit of text with each season is mine! Those refelctions suddenly came up making the papers. Well, the name of the kit is obvious: "Seasons Come and Go". Hope you will like this, I tried to capture a bit each season in a colour: Spring in the fresh green for all the new plants peeping ouy of the ground, Summer in bright rose, a very outstanding and vibrant colour, makes you happy, Autumn in orange, brownish, for the fall colours and Winter in a blue/lilac/grey for the frost and sometimes gloomy days. Now have a nice day, take if possible a bit your rest, sooner than you know, Monday already will be there! Looking at the clock I see I am somewhat later than normal. But there is a reason. I still had to make the preview of todays kit! Yes, I am terribly behind on making kits! I really have to consider whether I have to cut down a bit on the posting kits every day. May be I also should try to make some more quickpages and/ or standing alone elements. I think that takes a bit less time in making and then there could be a little more time to make kits. I am so used of offering every day a kit ( well, almost). that it could be a real kicking off procedure LOL. Still thinking about it, so for the moment there are still downloads every day. And I know I will not be able to leave the blog for ONE day. When sometimes I take one or two days "vacation" I really have to restrain myself not to post. What aweful dilemmas I have to cope with, hahahaha. If that's all my life would pass very smooth. I think I also must take a bit time to visit my friend Heidi again. May be I'll call her today, to see if she has a moment to spare. She also is a busy lady, always doing too much, which isn't so good for her, but I can understand her. Well, quit some bla-di-bla and not too much said, I think it's time to show you the new kit. It''s kind of funny one and I had much fun making this one. It is one for all cat lovers (sorry dog lovers, I must find something equal for you) and I think we all recognize the habits of our purring companions! I named it "Moments In A Cat's Life". Have some fun with it. Also have a very nice day with lots of fun moments! So a new day is ahead of us. As always there are things to do, but nothing special. Yesterday was a quit day around here, I took the day to do things on the computer, but was (again) in shortage of time to do all I wanted. So frustrating that there is always a lack of time. I think it is my fault too. I want to search for a specific thing on internet and then I find other things and have to read a lot and get links from one site to another etc. And then an hour is nothing! Must be a way to control myself a bit, but how???? Anyway, I wanted to ask you is you now the artist Alphonse Mucha? From origin he was a Czech, but spent a lot of time in France. When you'll see some pictures of his work I am sure you will recognize it. And that is what the kit of today is about. I found some work from him, showing the four pillars of the art. And I made this kit with it. I really like his work and I can already say to you there will another kit with his drawings. It was hard to think of extra subject related items, but I found something. And I must also give credit to Sylvaine, from http://scrap-artiste-lolotte.blogspot.com/, I used some of her things in the kit. 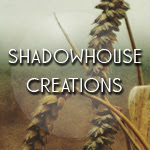 She is a very creative and artistique lady, who offers all of her work for free. And she makes A LOT. It's worth to visit her site. The kit is named "Arts of Beauty" and I hope you will like this. Make the most of your day, try not to stress too much, hahaha. I am not blown away! The weather forecast for yesterday looked much worse than it was. I couldn't say it was beautiful, but only late in the afternoon and evening the rain really was pouring down. However, when I went out for the shopping, all mentally and physically prepared for fighting the wind plus rain, I was surprised. The wind was not real hard and okay, it was raining but also that was to overcome. So far so good. Hahaha. Did you see the big button on the right of the blog, the one with the cat??? Isn't it awesone. There are more of them, as I mention below the picture. So I could change them now and then, because I downloaded them! 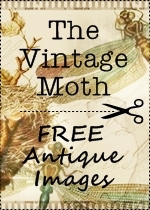 You should go to Susan, of http://scrappinobsession.blogspot.com/. Just take a look at those button and agree with me that they are beautiful. Certainly for cat lovers. Perhaps we should suggest to her to make also some for dog lovers? We'll hop over to some serious business. Today's freebie. I hope you'll have some space for another safari like kit. I gave it the name of "Dream of Safari". It's not too bad, I believe, so play with it and if not, tomorrow there will another kit, ALL different from this one. And now I finish, because I want to post still on the forums and then I want to get on with a kit I started yesterday. Still lots of things to make for it, only just made the papers. So have all a nice day, I hope no one is bothered by Gustav. I heard on the news it seemed not as bad as predicted, but still people are hurt and have to cope with damage, still not good. Let's all think a moment of those people, who will have to deal with that. As well as in other parts of the world, where nature also is playing around horribly! Thinking about it costs us only a moment, that's still to spare, I think. "Doswidanje"or "arrivederci" or "au revoir", till tomorrow. Did you had a good search yesterday with the freebielist? Boy, was it a long one! And then you had to cope with me again, because I couldn't wait with the award! YOU POOR THINGS!!! I think I will be rather short for now. Must try to get out of the house before noon, because rather nasty weather is coming up. Last weekend it was such nice and summeray weather and in a day all is changing. They expect not so few rain showers in combination with a lot of wind, may be on the coast here till force 6 or 7. So Kyra must make sure not to be outside when the wind is coming to that force, because of danger of flying over the streets without wings. LOL. I have today a kit in soft pastel colours. I tried to make a kind of heritage kit. I know, it isn't but may be I came a bit near it. But it is a kit to use for all kind of family pictures, real nice moments you captured with the camera and you want to preserve. It's not a "heavy"kit but it's a little bit different from the others, I think. Well, try to make something beautiful with it. Hey, suddenly Blogger is playing little tricks, with jumping on and off with the message there is no connection with Blogger and then there is again. Quick safe this post, before I have to start all over again. Have a very nice day! You must be thinking I am nutz to post 3 times in 1 day. But I am soo Excited, that I wanted it to share with you already. Receiving the award you post it on your blog(of course) and nominate 4 other blogs. And I think it is only fair to mention the name of the blog you received it from. That's all. Now I still have a bit less than an hour to play a bit around before I must make dinner. Yeah, I found a very convenient program for me. Probably a lot of you already now it, but for me it was a revellation. It ABR.Viewer.Net. 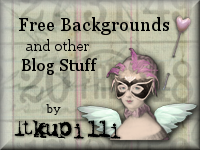 (all free) It turns photoshop brushes from the abr extension into png. Isn't that great. So I went on the internet like crazy, searching free photoshop brushes(there a soooo many) and tried it out. It works, certainly for my Photofiltre version. Perhaps it takes a few clicks more than in photoshop, but it is great I can use lots more of brushes now. Now I must get the practise of it in using them, but I will. So again I have something new on my computer. I can't say much happened this week-end. I did enjoy the good weather and yesterday morning, when it still wasn't so hot in the garden I did spent about half an hour reading with a cup of coffee at hand and it was a fine moment. All still so quiet around. Well let us see what the new kit is like. It is romantic, yeah! A bit Victorian like, but I am sure you have pics to with it. I named it "Remember Tender Moments". We all have such moments in our memorybank, do we??? So now is the time to relive them a bit, hahaha. Oh the two frames and also the ribbons in it are from Gunhilde, from http://www.storeide.se/gunhild/index.htm. Just recoloured them. Have fun with the kit and have a nice day too!